CANTON TOWNSHIP, Mich. – CBD oil, derived from hemp, is a new option to help pets who are in pain. The product does not contain THC, the compound that gives cannabis its psychoactive properties. Some pet owners have safety concerns, so Help Me Hank’s Hank Winchester took a look at the products and what consumers should know before considering it for their cat or dog. CBD oil is popping up for sale in a lot of places, including online. Before you purchase any, a Canton veterinarian is warning consumers that there are some things they should know about CBD oil before giving it to their pets. 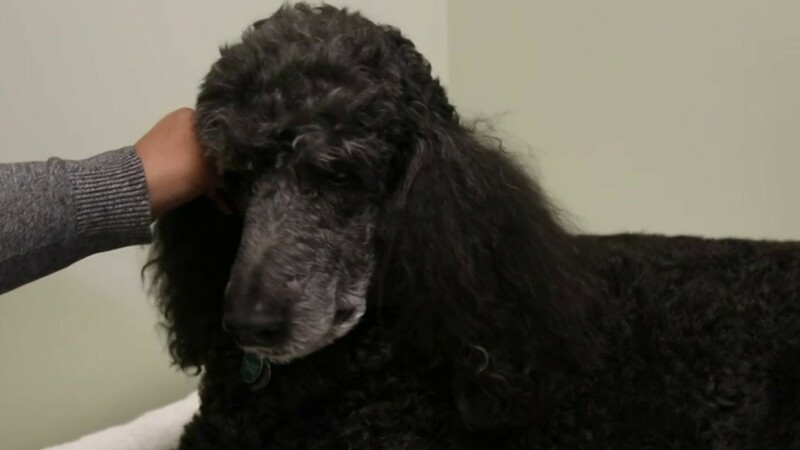 Derby, a standard poodle, is 12 years old and became a patient of Dr. Michael Petty, of Arbor Pointe Veterinary Hospital, to be treated for pain. “He’s a standard poodle and he has been coming to see me for quite a long time for acupuncture and he’s taking a drug called Galliprant and it’s been helping him really well. But the owner had noticed about a month or two ago that he just wasn’t doing as well,” Petty said. Derby’s owner said the dog didn’t want to go on walks anymore and appeared to be in more pain than usual. So Petty added CBD oil to Derby’s treatment plan. CBD oil is available for pets, but there’s not a lot of research on its benefits. Petty said a study done at Cornell showed that CBD helped with arthritis pain. Not all CBD oils are the same, and you want a high-quality one for your pet. Pet owners should check with their veterinarian before giving CBD to their pet as there are no dosing guidelines for the product. Derby’s owner said she saw improvement and she had advice for other pet owners. “I know you can find it everywhere but I would trust going to your veterinarian and talking to them about it and seeing if it’s gonna, you know — is this right for my dog?” Anne Alexopoulos said. CBD oil is given orally and can be expensive, but that’s because you want to purchase a high-quality product. The Food and Drug Administration is aware that some cannabis products are being marketed as animal health products. The agency stresses it has not approved any products and cannot ensure their safety or effectiveness. The FDA recommends pet owners talk to their veterinarians about the right treatment for their pets.